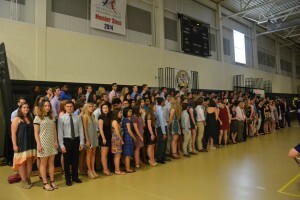 Many Moorestown High School seniors were celebrated for all of their academic, athletic and community service accomplishments this year and prior years at a recognition reception. MHS held the 2016 Senior Recognition Reception on Wednesday, June 15 for about two-thirds of the seniors. Family and friends filled the MHS gymnasium to celebrate all of their accomplishments. More than $165,000 in scholarships were announced and given to students that night. “I think it is really great the school hosts this reception. It’s a reflection of all of the hard work we’ve done over the past four years. It’s great they recognize the achievements of the class,” senior Dilan Trivedi said. The night started off with the announcement of valedictorian and salutatorian. This year was a unique situation, where there were three students announced rather than two. 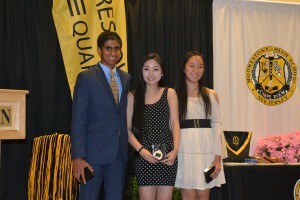 Salutatorian was named Trivedi and valedictorians were Kelly Li and Jessica Fan. “These two young ladies tied in GPA over four years, it was hard work and effort and something truly amazing… these two young ladies are graduating with GPAs of 4.90, the highest GPAs of my years as high school principal,” Seibel said. Students were then honored for their community service, in departments and for their GPAs. In community service, more than 31,722 hours of community service were put in by the seniors throughout their high school careers, and 21,800 of those hours were honored that night at the Recognition Reception. One of those students was Madeleine Morlino. She was the student honored by putting in the most hours of community service. She put in more than 900 hours during her senior year and about 1,500 hours throughout her high school career. She is going into the United States Air Force Academy. “For me, I like knowing that even as a teenager I can make a difference in the world, even as a small difference, like working with local veterans, animals and my church… I really feel humble and honored (being recognized tonight) and I wouldn’t have been able to do it without my school and community. So a big thank you to them,” Morlino said. Cords were given to students with GPAs over 3.7. Black cords were for 3.7 to 3.99; black and gold cords were for 4 to 4.24 GPAs; and gold cords were given for 4.25 and higher GPAs. Departmental awards were given in business, English, writing, arts history, fine arts, band, orchestra, vocal, math, computer science, biological, physical, science, industrial technology, history, world languages, and a number of athletic awards. 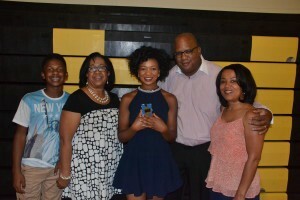 Senior Kamryn Gaskin was given a departmental award in fine arts. She has been a lover of art since she was 5. Throughout her academic career, she has received multiple awards in art. She also has given back to the community through art, such as teaching students in Philadelphia about art murals and how they impact the community. She will minor in art at the University of Alabama, majoring in communications. The night finished with a number of scholarships announced. Seniors received a total of $165,000 in scholarships that night. Scholarships include ones from MoorArts, the Rotary Club of Moorestown, the Lions Club, First Presbyterian Church, Moorestown Education Association, Moorestown Business Association Moorestown Garden Club and a number of community, school and memorial scholarships. Senior Kevin Calhoun received a Rotary Club scholarship, specifically the Scott Coffee Memorial Scholarship, the W. Edward Armstead, Jr. Scholarship and a Moorestown Soccer Club Scholarship. The Armstead Scholarship was established by Armstead’s daughters, in honor of his time on the Board of Education and his leadership. The scholarship is given to someone pursuing a degree in science or technology who demonstrates academic excellence, leadership and active participation in events that promote the advancement of the common good in the local community. The soccer and Rotary scholarship were given to Calhoun for his commitment to the club and run as well as his academic achievements and exemplary character. Calhoun is going to Villanova University for engineering. “It’s amazing. I was not expecting all of the scholarships, but it feels good to see all of my work paid off…. 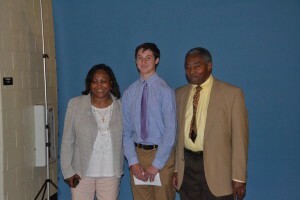 Living in Moorestown and helping out the community, trying my best to be a good student, it is incredible to be honored and I’m grateful to (all of the people and organizations) who chose me for the scholarships,” Calhoun said. The Sun reached out for a list of students and achievements recognized that night, but it was not provided by deadline.